What is an Overdraft Fee and How Do I Avoid Them? When you’re trying to get ahead with your finances, incurring unexpected banking fees can set you back. For example, an overdraft fee is a common charge that many Americans experience without realizing it. And, if you’re not careful, these fees can add up quickly. In fact, customers who overdraft frequently can pay up to $450 in fees per year. But what exactly is an overdraft fee and how can you avoid them? 2. Your bank will put the transaction through. However, the service doesn’t come cheap. In this case, your bank will charge what is known as an overdraft fee for overdraft protection. In many cases, you may have opted-in for overdraft protection – without even knowing it. Which transactions can trigger an overdraft fee? ATM transactions including withdrawals. If you opted for overdraft protection and withdraw more than you actually have in your account, you’ll be charged an overdraft fee. Debit card transactions including everyday purchases. One common debit card myth is that debit cards are free of fees. While it is true that with a debit card you won’t experience charges associated with credit cards like late payments, balance transfers, foreign transactions, cash advance or interest, there are still fees attached. These include service fees, daily balance fees, ATM charges, and of course, overdraft fees. According to the Consumer Financial Protection Bureau, most financial institutions charge about $34 per transaction for overdrafts. The term per transaction is important here. A few years ago, I incurred $120 in overdraft fees in a single day. Because all my purchases “went through,” I was clueless until about 12 hours later when I checked my mobile banking app. Interestingly, looking back at the statements now, one of the purchases I made was less than $10! Yet, the bank charged me $30 due to insufficient funds. It was a hard lesson to learn. That particular bank limited the number of transactions that they overdraft per day. Others will charge an extended overdraft fee if your account remains overdrawn for a certain number of days. Experiencing overdraft fees is not only costly, but it’s also frustrating as it’s your job to get your account back in good standing. Here are several tips to avoid overdraft fees altogether. Before you choose a bank account, it’s important to check the bank’s terms and conditions, especially when it comes to fees. While banks are no longer allowed to automatically charge overdraft fees without your consent, it’s easy to opt-in for overdraft protection without realizing it. It’s advisable to not get caught off guard with “protection” you may not need. Personally, I would have preferred a declined transaction to alert me to the fact that my account dipped below zero. Instead, the blissful ignorance of overdraft protection ended up being stressful and took almost an hour to resolve on the phone. Switch to a fee-free bank account. The best way to avoid hidden fees altogether is to switch to a bank account with no fees like Chime. With Chime, you don’t have to worry about incurring fees for non-sufficient funds. Instead, any payments or withdrawals that would result in a negative balance are rejected. As you can see, the less you have to worry about fees, the more you can focus on building the lifestyle of your dreams. Are you ready to take charge of your finances and stop paying overdraft fees? Don’t be afraid to ask your bank to waive the fees. If you were recently charged an overdraft fee, don’t be afraid to ask the bank to waive it. If you’re a “first time offender” like I was, your bank should be able to waive the fees within a few business days. Get paid earlier with direct deposit. One reason that people experience overdraft charges is that they don’t get paid quickly enough. You may even still deposit paper checks and wait for the checks to clear before you see your money. Both of these scenarios can inhibit your ability to budget and can lead to overdraft fees. With Chime’s Early Direct Deposit feature, you can get paid up to two days earlier than traditional banks. Your money is available when your employer sends the funds, giving you peace of mind. One major issue I have with large banks is that it takes time for transactions to update in the mobile banking app. Choosing an innovative bank account like Chime, however, speeds up the transaction process. 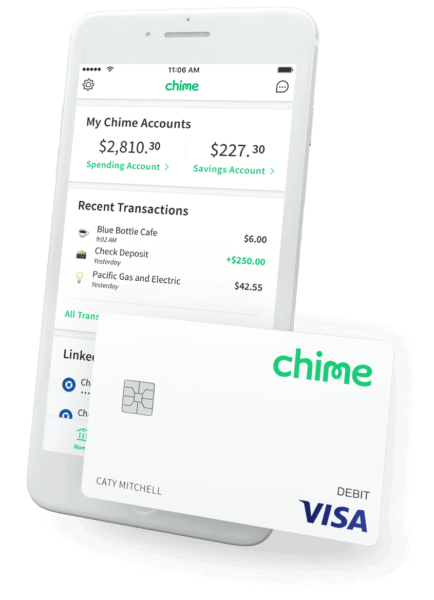 Chime provides you with real-time alerts for each transaction, allowing you to stay on top of your finances. If your account is going into overdraft regularly, it may be time to evaluate whether this is highlighting an issue such as overspending. In some cases, it can mean that it’s time to tighten the purse strings and go on a spending diet. You can also consider looking into budgeting apps to get some extra support. Some people end up overdrafting when an emergency pops up. However, as a reminder, having overdraft protection is not the same as having an emergency fund. When an unexpected expense occurs, the last thing you’ll want to do is shell out money for banking fees. How much should you set aside? A good rule of thumb is to save three to six months of living expenses in your emergency fund. Your fund should also be kept separate from your regular checking and savings accounts.